Quotidian digital media have fundamentally transformed the ways in which public protest is articulated today. Think of movements like Occupy and the Arab Spring, the protests in Gezi Park in Istanbul and the activities of the Muslim Brotherhood in Egypt. Protest is nowadays voiced on the street and online at the same time. Or it originates online and stretches further and further, assuming all kinds of material and collaborative forms. Think of #metoo. 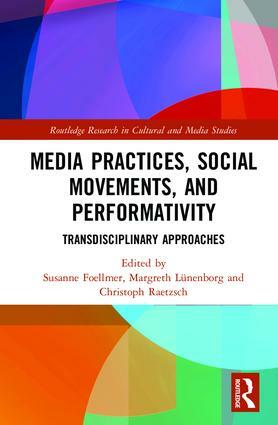 Together with Margreth Lünenborg (FU Berlin) and Susanne Foellmer (Coventry), I have edited “Media Practices, Social Movements, and Performativity: Transdisciplinary Approaches” (Routledge). It is a collaboration between media and communication studies with dance and theater studies. The case studies cover a wide cultural and geographical terrain – from Mexico to Japan, from German to Greece. A common interest is to develop the notion of media practice and performativity and employ it analytically to these divergent settings. The volume presents international case studies on the new dynamics of protest, articulation and community along with two programmatic articles on the role and legacies of performativity. On the basis of these approaches the contributors show the specific local embeddedness of new forms of publicness that emerge in protest movements. As a tribute to Randy Martin, we reprint his programmatic article “A precarious dance, a derivative sociality“, which originally appeared in The Drama Review (2012; 56(4)). What interested us in our article (apart from a critique of public sphere concepts) was the perspective of practice, paying attention to how minute shifts in media, knowledge and meaning over time allow for new public articulations to emerge. THE PUBLIC is no longer there. It’s created. Every day. By everyone. And we need to become more aware of how this happens because the usual suspects (journalists) are no longer the first or only to make it happen. What is now far more common is that speaker and audience positions alternate. Full reference [Article]: Lünenborg, Margreth; Raetzsch, Christoph. (2018). “From Public Sphere to Performative Publics: Developing Media Practice as an Analytic Model.” Media Practices, Social Movements, and Performativity: Transdisciplinary Approaches, edited by Susanne Foellmer; Margreth Lünenborg; Christoph Raetzsch, 13-35. Abingdon: Routledge. Full Reference [Introduction]: Foellmer, Susanne; Lünenborg, Margreth; Raetzsch, Christoph. (2018). “Introduction: Media Practices, Social Movements and Performativity: Transdisciplinary Approaches.” Media Practices, Social Movements, and Performativity: Transdisciplinary Approaches, edited by Susanne Foellmer; Margreth Lünenborg; Christoph Raetzsch, 1-10. Abingdon: Routledge.